Robyn Shea has an eye for design she can turn an ordinary space into something spectacular! 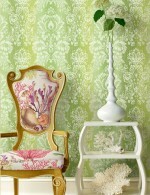 She is talented in so many areas and has perfected the art of hanging wallpaper! Robyn hung my wallpaper and my home now feels like the hip funky place i was envisioning.. Thanks Robyn i will recommend you to anyone and everyone you were fantastic!!!! !